The last 2 weeks were a hectic garam masala of racing and business traveling which meant being crucified with Mr. Jet Lag and Mr. Writer's Block on either side of me. 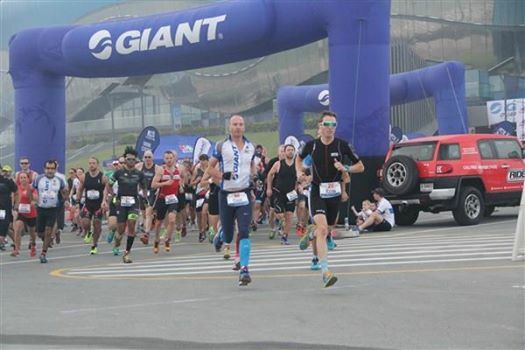 The buildup to Race.ME's Giant Duathlon Race 3 was the 1st of the Winter series 30K ITT organized by BeSport Bike Shop Abu Dhabi. 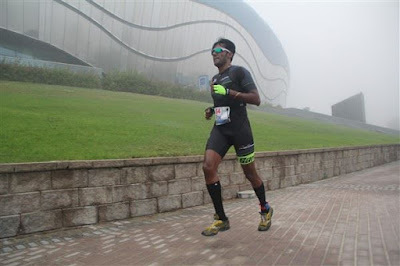 This race was an exercise in correcting past mistakes and settling into negative splitting based pacing. It's also a small crowd, same faces and a very competitive field. After riding at the absolute edge of the rivet for that day, I placed a modest 11th place in the open men's with 53:26 minutes. The following two results show the amount of time I sucked back relative to the last race as fitness levels increased. It was pretty sizable chunk of time of 6 minutes. a) There was a 47.2% increase in average power on Nov 11.
b) There was a 12.75% improvement in 20 min peak power on Nov 11. The same was the highest display of strength all year round. c) Average speed increased by 8.7% relative to Oct 29, a consequence of FTP improvement. d) I rode 5:15 minutes more at my aerobic capacity on Nov 26 than on Oct 29.
e) According to the Trimp chart (not Trump chart), I went into the Nov 11 race much more stressed than Oct 29 - about 15 points lower on the stress balance This gives me a baseline for future to compare against. The following weekend made for a super foggy race morning for the Duathlon at the Hamdan Sports Complex race course. This is the same venue as Race 1 from my previous post but with longer run segments of 3.5K each. A nasty surprise was to include a hill at the back end of the run course. I think racing is like the stock market. You think you have all your ducks in a row and you give your best shot but you're up against a stochastic set of circumstances that don't think your shot should be where it needs to be. That's life, every athlete knows it. And I was about to do the Great Indian Rope Trick - fooling myself. The runs were by far my slowest Duathlon runs. Holding back in Run 1 let me put some decent power down in the biking segment which involved among other things, a lot of bunny hopping and out-of-saddle hammering of the uphill segments. Unfortunately it's like the see-saw you played on in kindergarten. Cutting back 2 minutes from my last biking leg time at Hamdan course didn't mean the last run split went great. And that was where the rope tied a neat noose around me instead and the crowd left. Before I killed myself, my watch said 1 hour 23 minutes. I got a gift voucher and a free degreaser to prove it thanks to Mr. Andy Fordham. Thank god, it's a degreaser atleast this time. Data from the telemetry is shown below. You can see a few good seconds in Run 2 being lost treating the initial "shock" cramp as I've liked to call it. Compression socks didn't help. I've been hopelessly shaking to 'Only God can Judge Me'. This puts me back into thinking about salt loss through sweat. A colleague at work promised he'll share with me a sweat loss chart that I could tweak for a Duathlon. Another older athlete advised I try ginger tea in my bottle. Rule # 22 : People will always find an excuse to drink masala chai. Alright. The Giant Duathlon Race 3 ends the official paid racing for 2016. A month of burying into food and getting tortured with sugar and cakes await. Maybe I'll slap on an additional kg into the New Year's. Potentially scary times. 1. Every race has involved a bettering of my personal best at the course. 2. Every other competitor is busy blasting their personal bests along with you. 3. If you're flanked by the same racers in the results race to race, point 2 is correct. 4. I have had zero serious injury. 5. There is more potential to be tapped. 6. 'Tapping potential' must have come from the oil industry. Like tapping for oil, it involves experience, scientific experiment and data collection. I plan to whip out some of my Prithvi missiles from my cabinet for the next series of races in January and February 2017. If I know how to fire them correctly, they will put a dent in the status quo of race timings in Dubai and Abu Dhabi. If I mess up, I'll blow up! I also have an announcement to make about bigger and greater things for next year's phase of the racing season. The races in January and February will ultimately decide how much of a shape I'm in for what is to come. Sorry, being intentionally vague right now. Stay tuned. In the meantime, happy holidays!